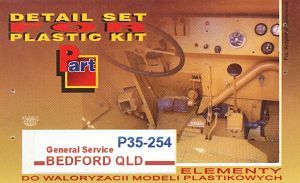 Part of Poland released this etched update set designed for the IBG Models kit #35015 Bedford QLD General Service and it addresses most of the issues with the kit as outlined in my kit review, while designed for the QLD many of the etched parts can also be used for the new IBG kit #35016 Bedford QLT Troop Carrier although I’m sure a separate set will be released for this kit. The set consists of three etched frets, 1 large fret A, a small fret B and smaller fret C which is in thicker gauge brass for the wheel hub and other suitable parts in the thicker brass, there is also a small clear sheet with replacement windscreens and the driver’s instrument panel dials. A small two page A5 instruction sheet completes the set. 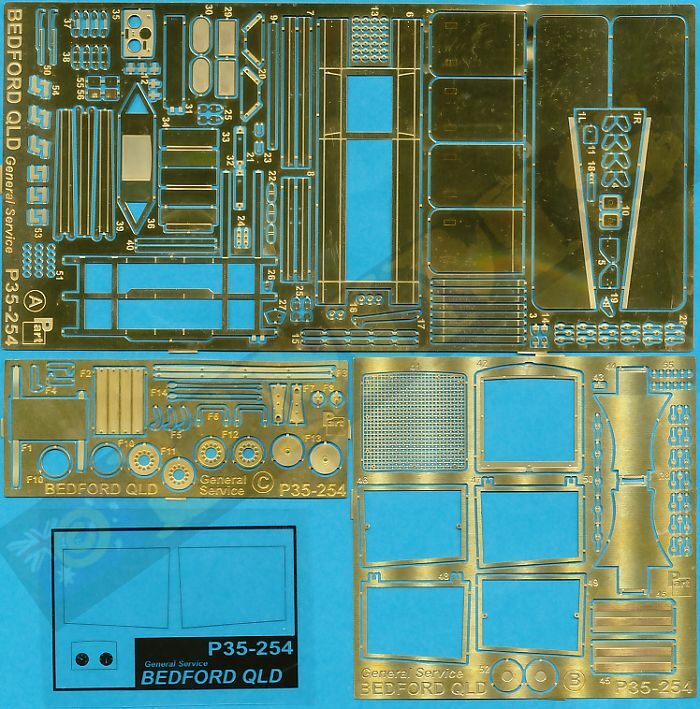 The quality of the etched parts is first class with well-defined clean details with some embossed and raised detail included as well as the usual engraved bending lines on the parts. There are many very fine and small parts such as bolt and rivet heads that will need care cutting from the frets and I usually use a steel ruler as a cutting board to provide a firm surface and a #11 blade to do the cutting ensuring of course to put your finger on the part being cut so it doesn’t launch into lower Earth orbit. Some of the etched parts completely replace the kit parts such as the fenders and rear mud flaps while others require some kit surgery before fitting as with the radiator grill so we’ll have a look at the set. For the cab interior there is a new 4 piece instrument panel with the clear film dials that replaces kit part B19 along with the driver’s foot pedal faces. The cab exterior gets most of the updates with the two fenders and fender steps completely replaced with brass as are the small sidelight brackets and fender support brackets, on the left side is the turn indicator arm but this is slightly too short from what it should be. The side door hinges are also replaced in brass as are the door handles and rear corner grab handles but these suffer for being flat brass and lack substance so you better to use the kit parts still for these. 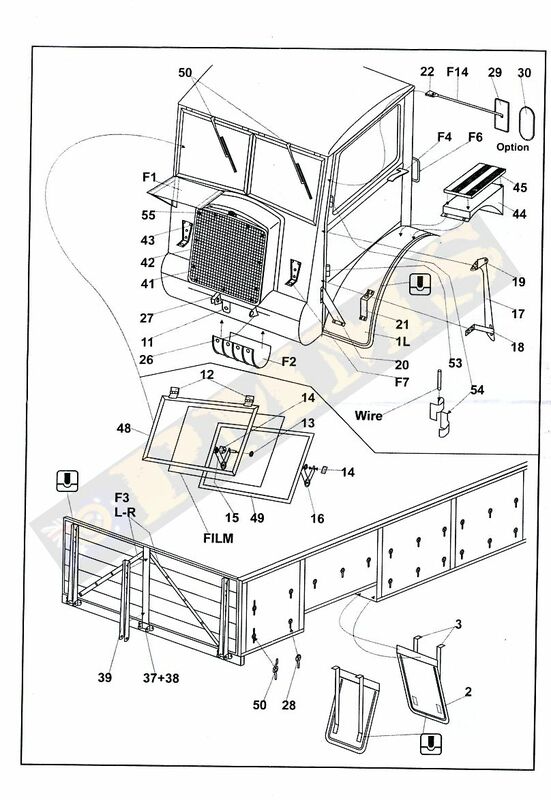 The radiator grill mesh and outer frame are provided in fine brass but you will need to shave off the radiator details first from kit part A4 which shouldn’t be a major job? You may also want to trim off the windshield frames and headlight mounting brackets from part A4 as these are also replaced with brass parts. You can shave off the radiator details still leaving the front plastic intact, but you could also cut away the radiator opening and blank off further inside to give a bit of depth behind the mesh if you wished? The two windscreens are replaced with an inner and outer etched frame with the clear film screen trapped between them along with the top hinges and inner opening bracket to you can position the screens in the closed or open position if you wish. There are also etched windscreen wipers to add to the screens as well as the gas detection panel in front of the driver and replacement head light mounting brackets either side of the radiator. 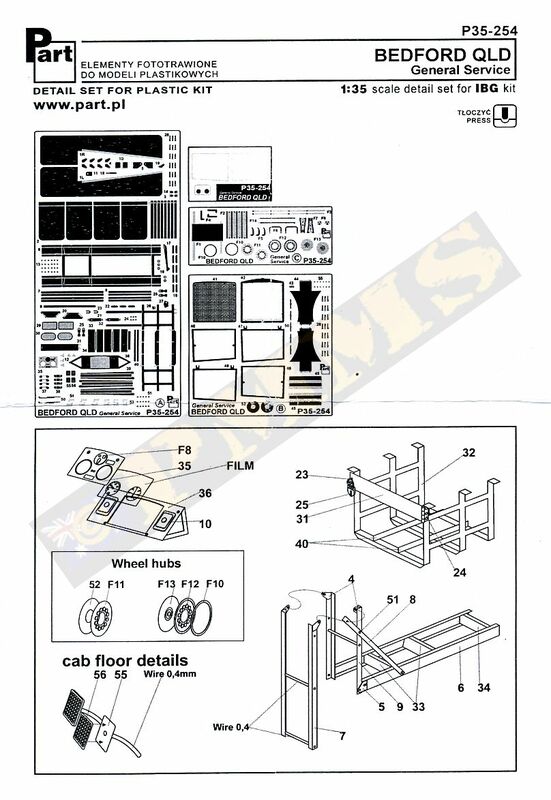 Other items include the lower front crank handle guide and two small tow lugs plus the underside curved suspension guard, the side mirrors are also provided but the etched mirror arm is again flat one dimensional and you would be better off using wire or sprue instead for a better appearance. Moving back the entire spare wheel rack is replaced in brass which requires some careful planning and bending of the parts for the easiest assembly but care will be needed with this although the end result is a big improvement over the kit rack. The underside POW can rack is also totally replaced in brass and again careful bending of the parts is needed for the best assembly. The rear cargo tray has new rear door brass stringers that need the kit stringers trimmed for the door and this will need care not to damage the surrounding details. The wheel mud flaps and supports are also replaced with brass for a far better scale appearance plus all the small tie down brackets along the sides are provided as small brass replacements. The wheel hubs have replacement brass sling discs with the hub bolts in the correct position to replace the incorrect kits parts, the brass discs are from thicker brass and also have two brass discs together to give good depth, the only thing is the hug bolts are a little shallow but do look better than the kit hubs with the incorrectly placed bolt heads. 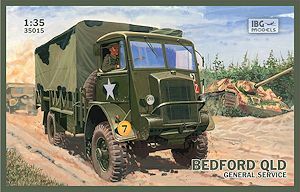 This is a fairly comprehensive update set for the IBG Bedford QLD and provides most of the details missing from the kit as well as replacement parts to improve the scale appearance such as the fenders and rear mud guards, many etched sets these days have so many parts that aren’t used but this set has very few redundant parts and should prove essential for anyone wanting to add all the missing detail as well as extra detail to their kit.